Our 2016 Country Workshops summer intern was Dan Asher, from New York City, but more recently down east in Maine. Through the summer Dan and I discussed the possibility of building a scaffold, so that it would be possible to paint the Riven Ash. It’s more than 30 feet to the tippy point, and located in a mushy wet area. And there’s close to zero budget for a project like this. scaffold would be held together with torx head screws. No nailing means no vibration, which means that things hold together quite well as the structure goes up. We started by digging four foundation holes around the Riven Ash in the surrounding muck. These were half-filled with coarse gravel that was well-tamped. For diagonals, we used scrap 1 by 4’s, and we found enough old scaffold planks to use as the flooring. We secured the units with clamps while the screws were driven into place. The tools were basic -- a tape measure, 4-foot level, and a cordless drill for driving the screws. I happened to have the needed ladders. The finished scaffold was sturdy and there was no fear scaling the ladders to get to the work spaces. I hauled paints and other supplies up to where was working with a bucket and a rope. 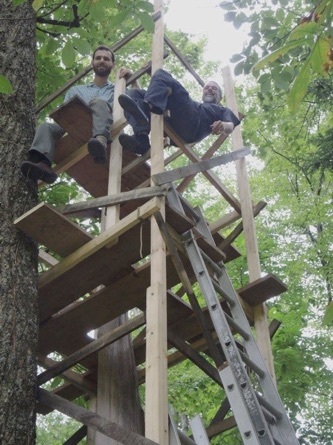 Dan Asher and Nate Chambers on the top level of the Wind Split Ash 2 scaffold. For a pattern, I returned to a uniform zig-zag. Louise noted that I had made a free-standing surfboard like sculpture painted with the same pattern in graduate art school. I like zig-zags! Painting took several weeks, working about two hours for each session on available afternoons. It was fun going to work, up on that sturdy scaffold. And with a unique bird’s eye view. The lower section of the Riven Ash doesn’t have that same clean, split surface. Instead there’s chunks of wood distributed at what look to be random angles. These chunks were painted with secondary colors – purple, green, orange and black. The chunks are somewhat decayed, another reason why I won’t be too surprised when someone discovers that the Riven Ash is lying on the forest floor. But for now, it’s still standing, and something that can be appreciated by anyone coming up our mile-long driveway. Dismantling the scaffold was almost a sad experience. I liked having it there. But it was never possible to view the painted Riven Ash until the scaffold was gone. The opportunity to paint the splintered and riven ash trees came about unexpectedly because of a wind microburst. The project material was presented -- suddenly. For years, Louise and I were looking at a misshapen scrub apple tree growing in an exposed location on a hillside pasture above our barn. This tree was on an elevated horizon line when viewing the pasture from the driveway to our house. And this tree was almost in my face when I mowed up there. Gradually, the apple tree got old, and diseased, and partially rotted, and died. Almost. Eventually the entire tree collapsed, but with a major root still attached to the trunk. The apple tree continued to live for a few more years, in its collapsed, prone position on the horizon of the hillside. In 2017 I started visiting that apple tree wearing my artist hat, rather than the usual land-owner/farmer hat. 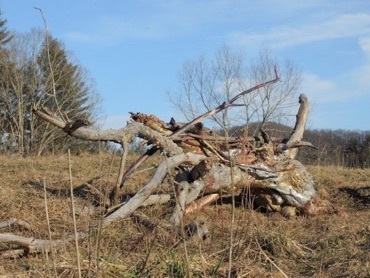 Now I was marveling at its form, which consisted of a massive distorted trunk --almost flat on the ground -- a few angling branches, then smaller branches, and lastly skinny twigs that vibrated in a breeze. There were also myriad small sucker branchlets growing in unexpected places. Like what happens with apple trees. I decided to partner with the old tree, making another outdoors sculpture. Butoh Dancer, as found before site cleanup and painting. decided that parts of the tree were very nice for rubbing their heads. The cow traffic was damaging the surrounding grassy ground; plus, there was a manure issue. The first step in this art project was erecting an electric fence around the area. An old solar powered fence charger was put back to work. Not much could be done about the ongoing decay, birds and insects without creating an environmental superfund site. Work began with removing rotten wood, and determining what was viable. I liked what I saw, but was also somewhat discouraged about the required effort. I also had to accept the fact that this work would continue to deteriorate, almost no matter what I could do. The next step was a primer coat using the same exterior paint that worked so well with the Riven Ash. This was also time consuming, happening over several afternoon sessions. I also found that I liked hiking up that hill, and began to feel that this project was a special partnership with that old tree. More and more I appreciated the form of the exposed roots, the twisted trunk, even those little branchlets that vibrated in the wind. This was something that just had to be done. I decided to call this project Butoh Dancer. I used all metallics for the coloration. Gold, silver and copper. I wanted this work to sparkle in the sun light, and maybe twinkle in the moon light, even if no people came to visit at night. but quickly realized that this would detract from seeing the shape of the tree – which was, in fact, the tree’s contribution to the project. Gold, copper and silver were applied as randomly as I possible. I liked the effect. 2019. When I hike up the hill to visit Bhuto Dancer, not much is left. The cows were kept out. But the weather, insects, decay and birds -- and what other cute little creatures? – continued with the many cycles of life on our planet. Coda. 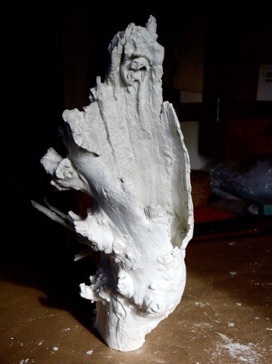 A two-foot chunk of Butoh Dancer that was still sound two weeks ago has been freed from the outdoors site and is now in the process of becoming and an indoors sculpture. Here’s a photo of Bhuto Dancer II, with primer paint, as I offer this story. I hope to do other outdoors sculpture projects… when the elements come together. Butoh Dancer II, with primer coat.